Aloha. 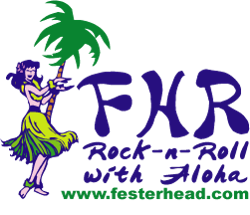 On May 11, 2011 after more than 10 years of Internet broadcasting FesterHead Radio has shut down. This experiment in ecclectic music was an outstanding success; it's just time to move on. Thank you to all that have listened, sent in music, or used any of my PAL or PHP scripts. In the end I hope to have made a difference with my enthusiasm, knowledge, no-frills / no-bs support, and witty humor. Wanna play Klax? Don't cost nothing.